The substance of paint has a material presence—it can be thinly or thickly applied, using a wide variety of tools, in a controlled or loose gesture—and the work of artists in this gallery, all of whom have lived and worked on the East End of Long Island, have explored this in a variety of ways. In Blinds and Shades, Josh Dayton merges painting and sculpture by attaching terra cotta forms to the canvas and extending the painted surface—a form of drawing in space. Grace Hartigan pays homage to her art-historical forebears, in particular the nineteenth-century French painter Georges Seurat, by adapting his “pointillist” technique of using small distinct dots of color to form an image while introducing her own expressive gesture. 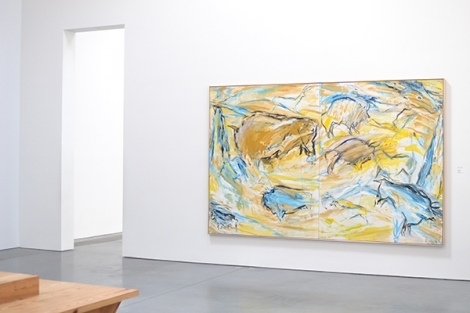 On a trip to Southwest France in the early 1980s, Elaine de Kooning explored the legendary Paleolithic caves in Lascaux. She didn’t expect to discover a major theme that would occupy her work for several years, but she was immediately drawn to the directness of the imagery, vigorously washing, streaking, and splattering paint across the static, outlined forms of the animals to create a vibrant composition. “I want the surface to live,” Herman Cherry said, and in the pulsating surface of Throb, he has used color to create energy. When asked about the meaning of his work, John Opper once responded concisely that “painting is concerned with painting”— an end in itself rather than a means to communicate other concerns. Here vertical bands of varying widths vibrate with clouds of color that seem to float against a soft ground, denying subject matter. Syd Solomon experimented with radical ways of applying paint to canvas. He used aerosol sprays, masking off areas of the canvas, and pushed paint with tools not limited to a paintbrush—all in pursuit of a new vocabulary for abstraction. Betty Parsons’s career as a gallerist and advocate for art and artists is legendary yet she always pursued an active role as an artist herself, and her work shares an affinity with the “primitive” art that she and her artists, including Jackson Pollock and Alfonso Ossorio, readily embraced. 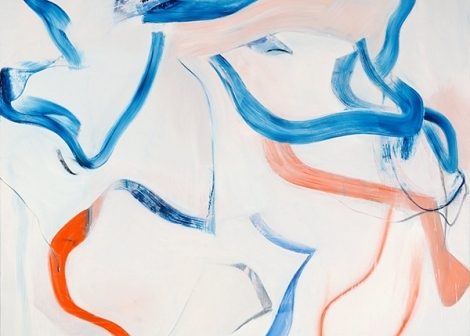 “Paint as if every stoke was your last,” Willem de Kooning once said, and the paintings of his last active decade, such as Untitled XXXVIII, attest to the urgency he felt throughout his entire career. Here ribbon-like strokes cascade in swathes of vibrant color, with passages of luminous white that veil but do not obscure the paint beneath—each stroke a surety in the evolution of painting where the material substance is of primary concern.